So, as I said, it’s not very difficult to make ramen eggs, just make sure you have the time to make them because they need to marinade overnight. Also, consider how you like your eggs boiled. Do you like them soft boiled, medium boiled or hard boiled? Let’s go through how to boil our eggs first shall we? First off, let’s talk about bringing our eggs up to room temperature. The reason this is important is that the cooking times I am about to list will not work if you start boiling the eggs whilst they’re stone cold. Yet, at the same time, you don’t want to sit around waiting for eggs to warm up, since it can take a while. So what you do is you put your eggs in a bowl of lukewarm water (NOT hot water). The water should be just warm enough to warm the eggs up without cooking them. Leave the eggs in the water for about 10 minutes, and then you should be good to go. Make sure that this is the first thing you do before preparing your other ingredients. The way I boiled my eggs was by bringing a large pot of water to a gentle simmers. Yes, that’s right, not boiling water, simmering water. I then add the eggs. As soon as you add the eggs, start timing. The reason I prefer to simmer the eggs rather than boil them is becuase the eggs won’t bounce around all over the place and crack whilst they’re in the water. 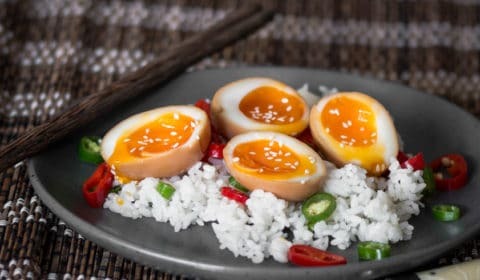 And yes, if you decide to make a hard boiled egg, that doesn’t mean you can just boil the absolute crap out of them and expect them to be ok. An overcooked boiled egg will have a super dry, crumbly yolk, and a weird greenish layer outside of it. So try to avoid that. After I boil my eggs, I plunge them straight into ice cold water to stop the eggs from cooking any further. 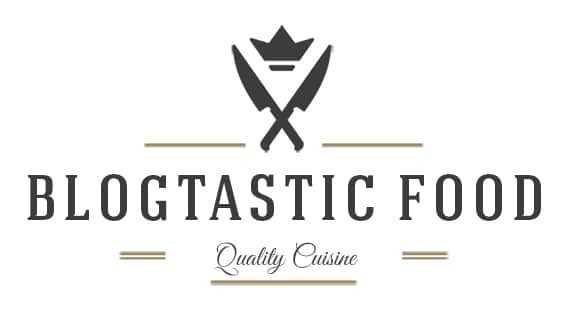 So it’s all about staying in control of the cooking process. 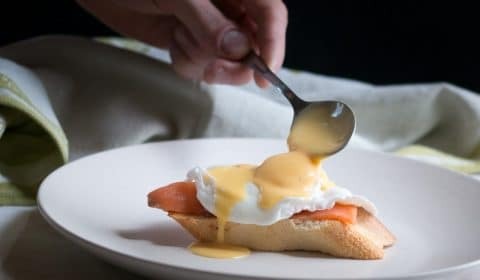 Another little tip, when you put your eggs in the simmering water, give the eggs a very gentle stir 2-3 times for the first couple of minutes of cooking. This just helps the yolk stay in the middle of the white. 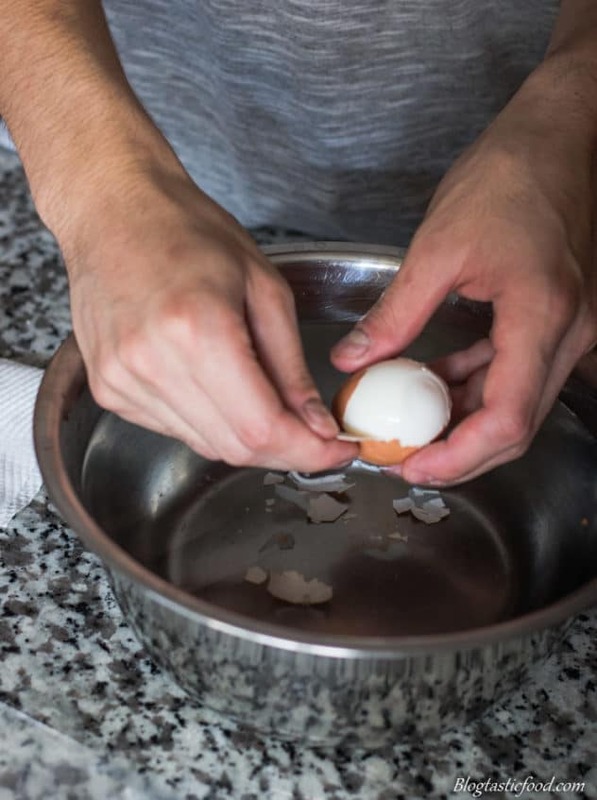 So, there is something you can do to make peeling an egg very easy and straight forward. First, crack the egg all over before you start peeling it. Then, peel the egg as you rinse it in a bowl of water. The water can help you take off that shell with ease. And you’ll also notice that there is this thin layer of papery skin beneath the shell. You want to try and peel that way too. When you do, you should find that the shell comes off nice and easily without ruining the structure of the egg. 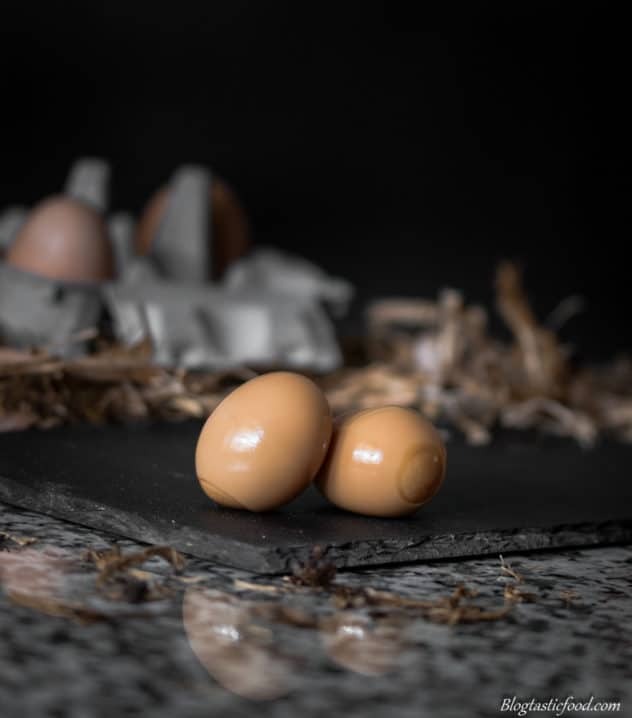 Take your time when peeling the egg, don’t rush the process and make sure the egg has been in the ice cold water for at least a good minute before you start peeling. Ok, so the marinade is very easy, you boil all the ingredients together so that they combine and so the chilli starts to infuse. The only thing you need to make sure of is that you don’t start marinating the eggs while the soy mixture is still hot. Otherwise, you’ll keep cooking the egg when that’s exactly what you don’t want to do. Another thing you may want to consider. 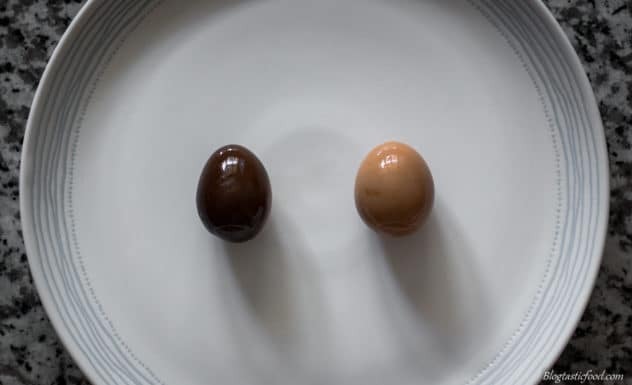 I tested out how both dark and light soy sauce affects the egg. And as you can probably tell, the dark soy sauce gives the eggs a much darker colour and a more intense flavour. Here is the difference between the two. I prefer using the light soy sauce in all honesty, but that’s just me. I find that this marinade works well, but if you want, you can add more flavours. Feel free to take away the spice, or add more aromatics such as cloves, star anise, cinnamon stick…whatever you like. This will allow you to completely cover the eggs in the marinade without needing to use a huge amount of it. 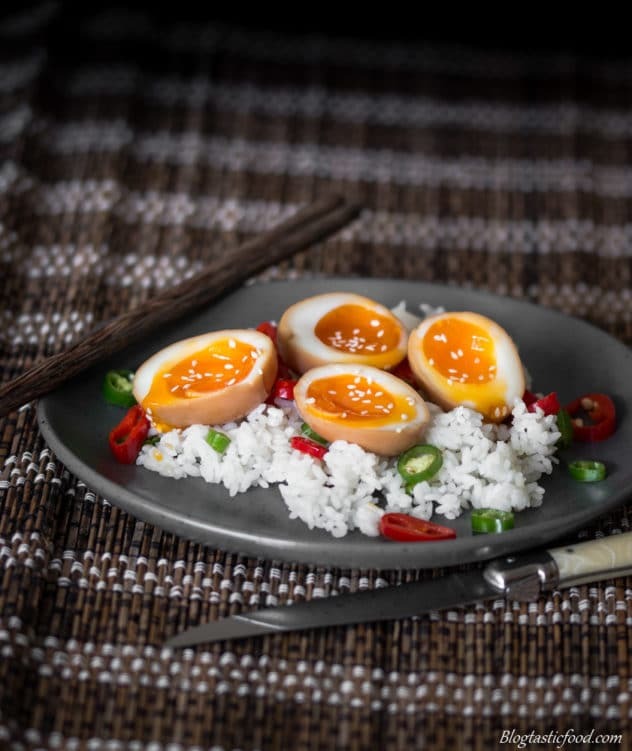 Thank you so much for reading through my post, I really hope you enjoy these ramen eggs. If you wish to subscribe, feel more than free to do so. Other than that have an amazing day!! 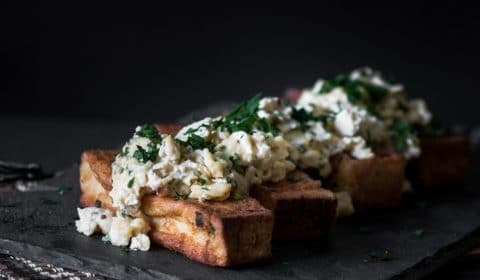 An easy way to make eggs taste twice as awesome! Put the water, mirin, soy sauce, chilli and honey on a pot or pan, then bring to a boil. As soon as the marinade starts boiling, turn the heat off and set aside. Get a big bowl of water and fill it with at least 2 big handfuls of ice. Put plenty of water in a pot, bring to a boil, then turn the heat down to gently simmer the water. 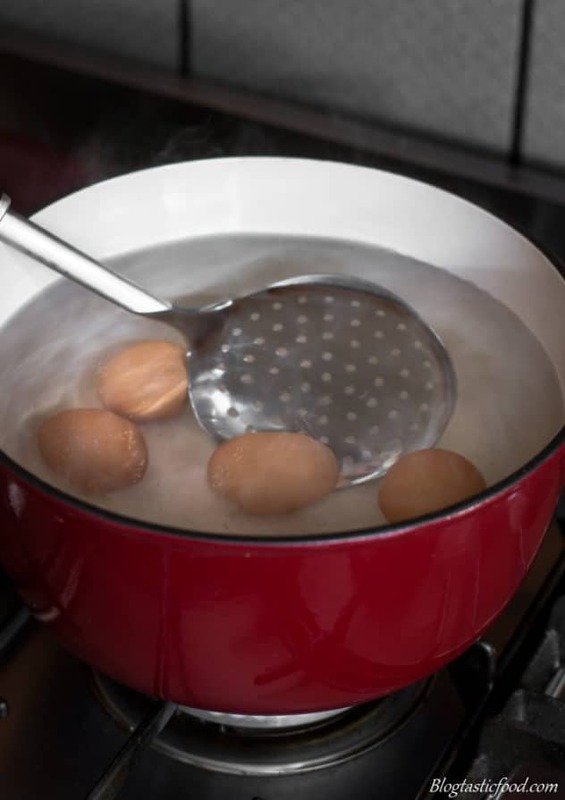 Slowly submerge the eggs into the simmering water using a large spoon. As soon as you put your eggs in the water, start timing. 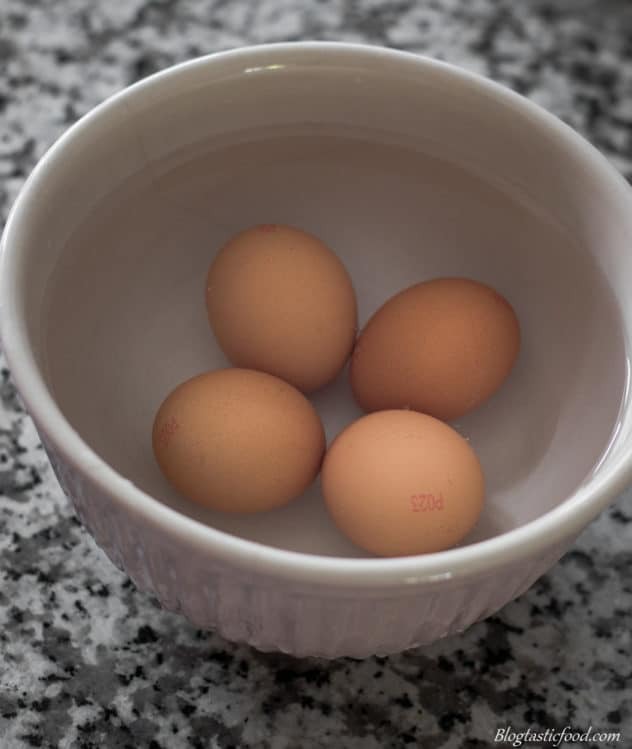 a soft boiled egg will take about 5 minutes, medium boiled eggs will take about 6½ minutes and hard-boiled eggs will take about 8½ minutes. For the first few minutes of simmering, gently stir the eggs in the pot about 2-3 times. This will help the yolk stay in the middle of the white. Transfer the eggs to your ice bath, leave for a minute or 2, then crack and peel them. Crack the eggs all over before you start peeling them. And use the water in the ice bath to rise the eggs as you peel, it'll make the process much easier. 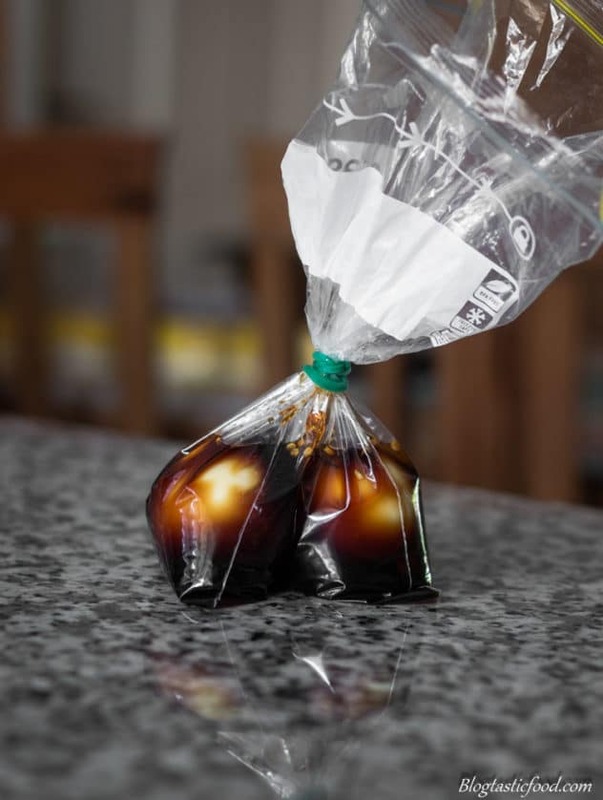 Once the soy marinade has cooled down (you can put it in the fridge covered to speed up the process), put both your eggs, and your marinade in a ziplock/ sandwich bag, making sure the eggs are fully coated, and that the air is expelled out of the bag/s before you close them. Leave the eggs to marinate in the fridge overnight. Then, serve them with any dish you want. Fried rice, noodles, your broth etc. - Bring the eggs to room temperature before boiling them. - You can quickly bring the eggs to room temperature by leaving them in lukewarm water for 10 minutes. - Make sure you shock the eggs in ice cold water to stop them from cooking too much. - Gently stir the eggs around for the first 1-2 minutes while boiling them to make sure the yolk stays in the middle of the white. 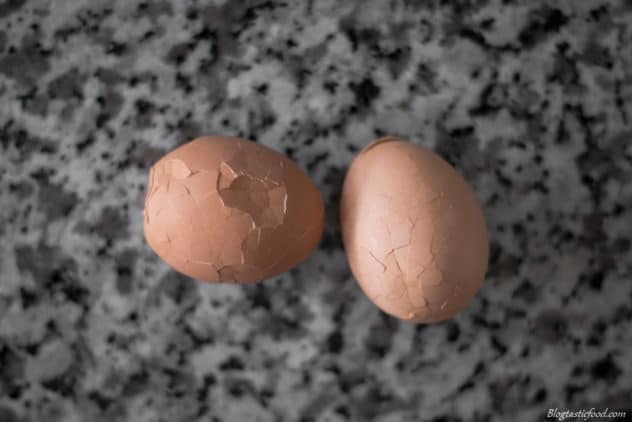 - When you peel your eggs, crack it all over before peeling it, use the ice cold water to rinse the eggs and try to peel off that thin bit of membrane as you peel. - Make sure the marinade has completely cooled down before you start marinating the eggs. - Use a sandwich bag to store your eggs and marinade. 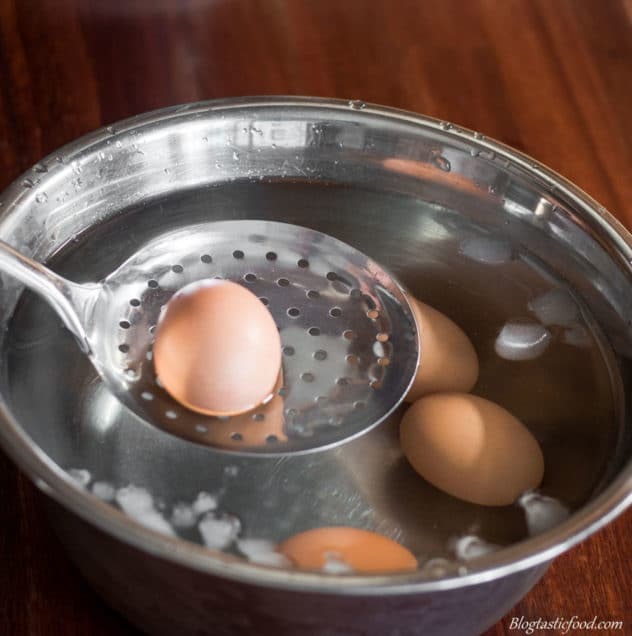 Very useful tips on how to boil an egg…. there’s a lot to know even about soothing that looks so simple and easy! Great post! Thanks so much im happy you like it!! I love ramen eggs! Nice idea to use some chili in the marinade, will remember that one. I love adding eggs to ramen, can’t wait to try this! Thanks for sharing. Glad you something out of it! No worries and thanks for visiting! Hope you like the recipe. I’m SO excited to make these. The eggs are likely my favorite part of my favorite bowl of ramen. Thank you! I love the tips on how to boil the eggs. I saved your post on Pinterest for future reference. I am going to try your egg boiling technique when I make my egg curry. I love eggs in a bowl of ramen! These look fantastic! This is such an awesome idea! I can’t wait to make these next time we have ramen! Great tips for boiling eggs. Helpful to see the interiors. I serve boiled eggs on my ramen a lot but haven’t marinated them before. I’ll have to try this recipe! Thank you so much for the comment Heidy!! I really hope you like these! Let me know your thoughts! Thanks so much!! I really hope you enjoy them!